Application Special for Masala, Pharma, Surgical, Oil Industries etc. The Continuous Band Sealer is suitable for small bags packaging and adopts the electronic constant temperature control system and stepless speed adjusting transmission mechanism. With the enormous support of our deft team of professionals, our organization has come up with a wide range of Band Sealer Machine. 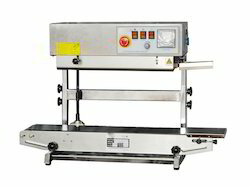 These Band Sealer machines are used in various industries for sealing or packing of pre-filled pouches of various products. Looking for Band Sealer ?